Last year, online and in-store shopping were neck and neck for the holiday season. But if predictions for this year are solid, online spending will outpace brick and mortar sales by a wide margin. At least that’s the view from Deloitte’s 2017 survey which estimates shoppers will spend 51% of their budget online vs 42% in stores.Let’s look at several other expected retail shopping trends and how stores might respond. It is more blessed to give than to receive. And self-gifting counts! 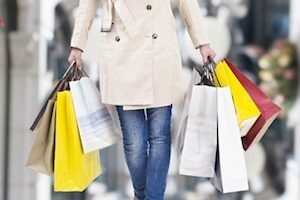 Fifty percent of respondents surveyed by Deloitte revealed that they’ll shop for themselves while shopping for others Displaying merchandise in a way that supports this trend could involve highlighting items related to self-care, fitness, adventure, and indulgence along with BOGO specials that encourage shoppers to buy one for a special someone and another for themselves. Staff can also be trained to ask, “Is there anything special you’re looking to get for yourself this season?” as a follow up after assisting customers with checking off the items on their gift list. These days, gifting is becoming less about tangible items and more about experiencing a “present” moment that creates lifelong memories. According to Deloitte: “27 percent of respondents said they prefer to buy gifts that are an experience and 24 percent indicated they plan to host or attend more holiday events with friends and/or family than participate in a traditional gift exchange.” That’s bad news for retailers looking to move inventory of traditional gift items. But every experience does require supplies. Whether that’s the perfect rod for a deep-sea fishing adventure or bulk snacks for a holiday event, retailers should look for opportunities to position their merchandise as supporting the holiday quest to create the perfect experience. Retail shopping trends show smartphone users are going to be out shopping in droves this season. They are using their phones to find sales, deals, and discounts (48%), check whether an item is in stock (54%), and pay for purchases in store using a mobile wallet app (22%). From ensuring store inventory is updated on the company website in near real time to ensuring that cashiers are familiar with processing payments using the most popular wallet apps, retailers need to deliver a seamless technological experience for shoppers. Staff also needs to be aware that shoppers will be browsing their smartphones while in the store to look up features, reviews, and better prices for merchandise. Sales reps on the floor should be prepared to work with consumers who are more informed than ever. The goal is to stay ahead of the competition and close sales before the customer decides to simply go home and order online from another source. Eight out of ten people plan to shop in late November through early January for holiday gifts. But according to Deloitte, they are making their decisions about where to shop and what they will buy much earlier. These decisions are made based on digital interactions—from viewing ads to seeing reviews in social media to browsing websites. Deloitte’s advice is simple: “Retailers must get ready to lure shoppers through a memorable experience.” The same will hold true in 2018. Retailers should already be planning the best ways to engage shoppers with an exciting and rewarding online brand experience if they hope to keep in-store sales high next season. What about That Increase in Online Shopping? In the quest to keep from losing more market share to e-commerce, traditional retailers need to step up their game to increase brand loyalty and create an in-store customer experience that’s worth the drive. While it might be tempting to cut back on seasonal staff if in-store spending is on the decline, there’s also a case to be made that in-store shoppers need more personal attention and staffing levels should be increased. Whichever course of action retailers take, there’s still a pressing need to get that hiring done as efficiently as possible. With our Applicant Tracking System and Onboarding technology, retailers can focus on satisfying shoppers and not on shuffling paperwork. Learn more about retail shopping trends and how our technology can help by contacting us today.